Midnight Blue, skippered by Jason Michas of New York, NY, was victorious in the Audi Melges 20 class. Sunshine-starved sailors from the Northeast reveled in summer-like conditions at the 19th edition of Sperry Top- Sider Charleston Race Week, sailed April 11-13 in beautiful Charleston, SC. This international event drew competitors from 27 states and five continents, from as far away as New Zealand, Scandinavia, Brazil, Guatemala, Australia and Peru. Courses inside and outside Charleston’s harbor hosted racing for Audi Melges 20s, Melges 24s, Viper 640s, J/22s, J/24s, J/70s, J/80s and Tartan 10s, as well as PHRF, HPR, Pursuit and (new for 2014) Multihull divisions. No class had more young standouts than the Audi Melges 20s, with 24-year old Jason Michas’ Midnight Blue (New York, NY) topping the 22-boat fleet by 13 points. 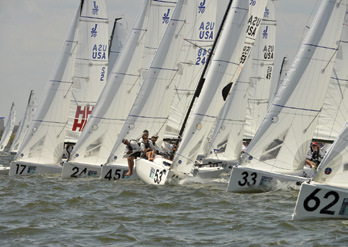 Bombarda, skippered by 23-year-old College of Charleston racer Grace Lucas (Little Silver, NJ) finished fourth. Lucas attributes Bombarda’s success to her crew. “We’ve got a couple of great college sailors and ‘big daddy’ Sam Rogers on tactics, and they’re making it fun and fast out there,” she said. “It’s definitely going to be hard to go back to FJs and 420s after this week!” Another College of Charleston student, 20-year old Declan Whitmyer, Jr. of Stamford, CT, skippered Slingshot to 11th place. That sentiment was echoed by Brandon Flack, whose J/70 Torqeedo (Stonington, CT) finished 15th. “Imagine a cross between a beach party and a huge regatta,” Flack enthused. “They mix the two so well you can hardly tell when one starts and the other stops. 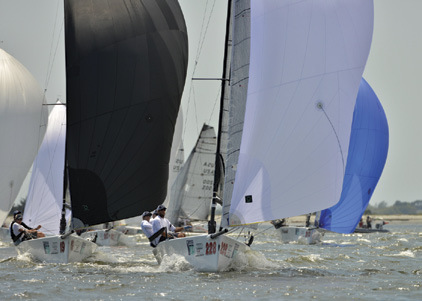 If you have not been there yet, you are truly missing out on one of the best U.S. regattas ever!” Visit charlestonraceweek.com to learn more.